It’s just a few days until next Tuesday's November 8th election, and we’re working hard to spread the word to ensure high voter turnout! A School Board seat was decided by only 34 votes last year so your vote matters! This year the board majority is at stake. We cannot return to the days of audit violations and educational dollars being spent outside the classroom. Jennifer, Sheillah and Irene have spent years selflessly working to improve our schools. We need to elect them to keep building on the steady progress the district is making. Most important is to cast your votes for Evans, Dallara and Sobolov 1-2-4 for Hoboken School Board. Polls are open from 6am-8pm and you can find your polling location here. It's urgent to Get Out The Vote! It's as easy as messaging or emailing your friends to remind them how important this election will be. Let people know how many of your friends and neighbors are supporting 1-2-4! On election day, be sure to wear a button or a t-shirt, and get a balloon or signfor your stroller at our election day HQ at 626 Bloomfield St. Also please consider volunteering an hour or two to help remind Hoboken to vote! 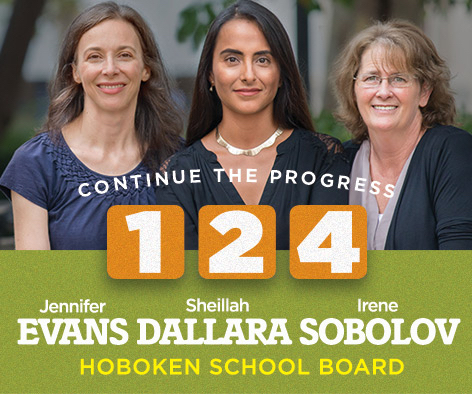 We need to show Hoboken there's overwhelming support for Jennifer, Sheillah and Irene! Don't despair if you won't be in Hoboken on election day! You can apply to Vote By Mail and, at the same time, vote in person at the County Clerk's Office until 3:00 p.m. Monday, November 7. Finally, PLEASE forward this email to your friends and neighbors. Spread the word about Jennifer, Sheillah and Irene!